I'm not sure when the misconception that fish is difficult to cook came around but it's amazing how many people tell me they're truly scared of cooking fish. Cooking fish is really not that bad. 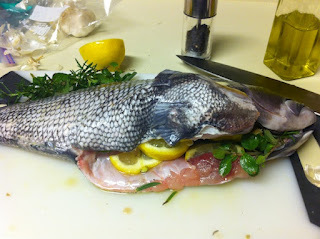 It's actually quite easy - as long as you cook the fish within a few days of buying it, I will guarantee success the first go-around. 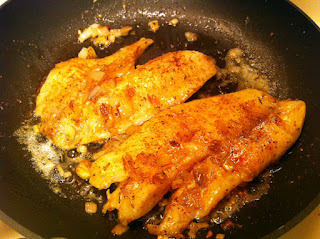 Pan-fried, cajun-seasoned tilapia (or other similar whitefish) anyone? The ingredients are simple. The cook time is under 10 minutes. The prep time is under 5 minutes. The cost is under $10. 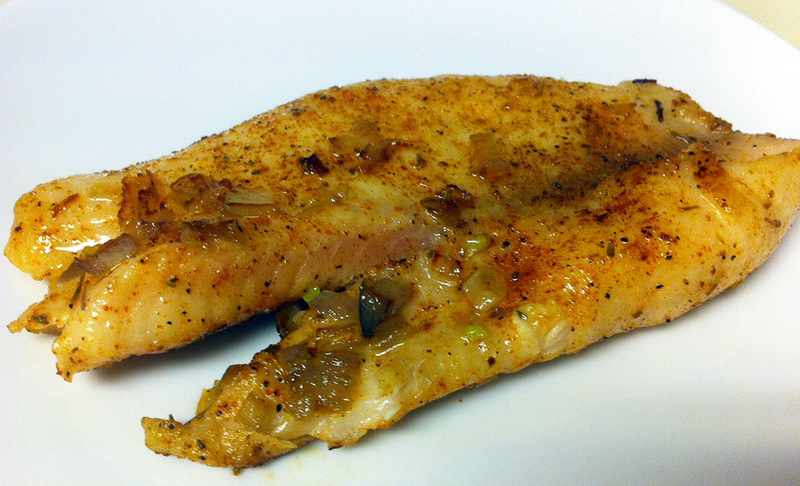 Your house won't smell like fish oil. And nearly everyone is impressed when you cook seafood. This is a beginner recipe. But everyone can embrace its simplicity. While Matt discovered that cooking can really impress a girl, I've learned that baking can really impress a guy. Whether it's baking a cake for your boyfriend's birthday, cookies to thank a guy friend who did you a favor, or bringing a loaf of homemade banana bread as a host gift when a guy cooks you dinner on a third date, I've only ever received positive feedback when I bake for a guy. They all love it. I started baking about six years ago (Of course, it all began one night when I was just looking for something mindless to do after a long day spent in the library studying tax law...). I wandered through the baking aisle of the grocery store and bought some pre-packaged cookie mixes. I baked four dozen cookies that night. Three years later and I'm still baking. And now I only bake from scratch. Why? Because it's rewarding to create something on your own and then watch someone you care about enjoy it. To have a stressful day at work but come home and relax in the kitchen with a glass of wine and a new recipe to try out. To wake up early, brew some coffee, mix together some ingredients, pop your creation in the oven and know that ten minutes later your entire house is going to smells cozy. And that when that sleepy guy crawls out of your bed and plops on your couch his eyes are going to light up when you hand him a warm apple and cranberry muffin. And let me tell you--- it's really not that hard at all, especially if you follow the same mantra that Matt hammers home on this blog: Just make it fun. One thing to keep in mind though. While I love Matt's theme of cooking without a recipe, you can't really do that with baking. The right amount of flour, sugar, and baking soda can make or break a recipe. That said, here are two (easy) recipes. Both will impress your man, or your potential man. Or even just your guy friends (Or practice baking homemade goods for your dad this weekend to celebrate Father's Day). *This is a low fat recipe that I found online and altered slightly. The best part? You cannot tell that it's low fat AT ALL. Every so often you fall into a rut. The monotonous chopping on the cutting board. The familiar bing of the numeric keypad on the microwave. 4 quarts. 1 tbsp. 8 minutes to boil. 10 minutes to cook. Although, it's probably not smart to follow your visions of grandeur for that first time you cook for her (Food Network contestants can't pull together a meringue in 30 minutes, so what makes you think you can too??? You're already stressing out about everything else!). So maybe on that third meal, you step out of your comfort zone. Cook something you've never cooked before. Try something completely new. It may not deliver the same kind of adrenaline as skydiving from a Groupon-promoted, hippie skydiving coop, but it could work for a monotonous Tuesday night. But be honest, tell her you have no idea what you're doing. Don't be too serious. Make it fun. Have her help you out. Work together. Mastered grilled chicken? 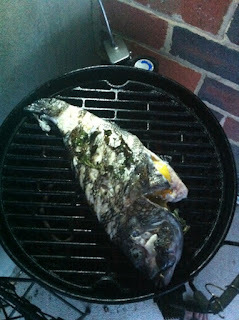 Try grilled pizza or a grilled whole fish. I tried to make squid-ink pasta one time. We bought fresh, whole squids from the fish market, cleaned them, "attempted" to harvest the ink, and then "attempted" to make pasta AND use the squid ink. It failed brilliantly. But I can assure you, I'll always remember our attempt at squid-ink pasta, and I know she does too. I couldn't tell you what we ate instead or if we went hungry, but making something different, and together, was all that mattered. The other weekend I found myself wandering around the DC Fish Market. Bored with the standard jumbo shrimp and wanting to avoid another failed attempt at squid ink pasta, I settled on a 4 lb. 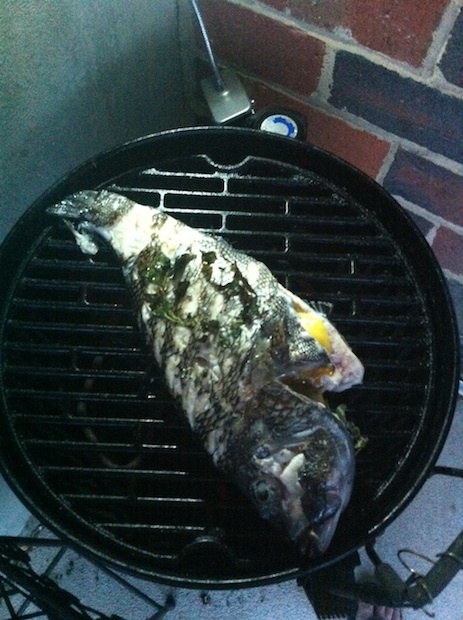 black sea bass. 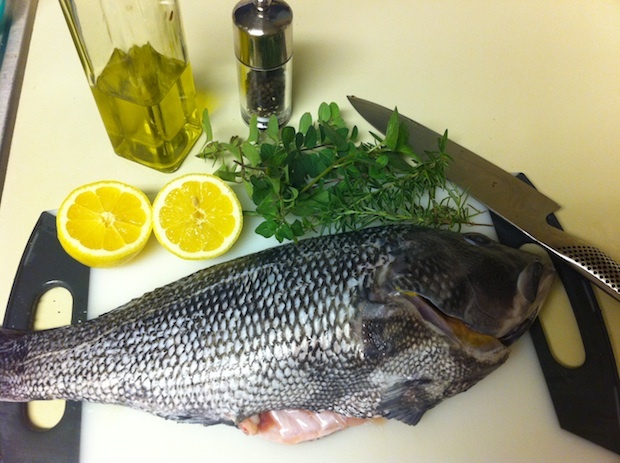 Now I've cooked a whole fish once before, but it had been awhile, and I couldn't remember any of the details, so in my mind, I was starting with a clean slate.